Like banthas and want to show off your skillz with a needle and thread? 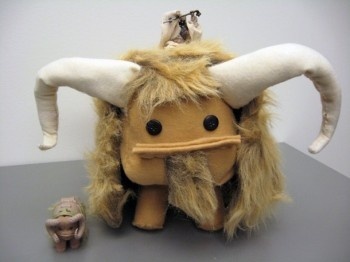 Take a shot at this do-it-yourself cuddly bantha toy, courtesy of Starwars.com. This allegedly simple project requires little more than some felt, stuffing, fake fur, a couple of buttons, a sewing needle, some thread and the ability to combine all of the above without poking your eye out. You'll also need some chenille stems, whatever that is (I thought she sang with The Captain back in the 70s) and "a whole lot of love." Oh, who am I kidding? This looks complicated as hell. I couldn't make this thing to save my life, at least not without burning down my house. This 11-step craft reminds me of nothing so much as those "draw a cartoon character in four easy steps" things in the back of old comic books, where you start with one circle, then two circles, then a line and then blam, suddenly it's Archie and the gang. I hated those things; my drawings always came out looking like they were coming along swimmingly right up until that final step, at which point the 8.9 magnitude earthquake struck. But there's no denying the little beastie is cute, and if you've sunk some points into the Arts and Crafts skill tree it'd make a great gift for that rabid Star Wars fan on your list. Or go to Plan B: Pay someone less spastic than you are to do it. Think you can handle this without having to call an ambulance and a lawyer? Decide for yourself at Starwars.com!